The luggage finally arrived, and now we have to change our clothes three times a day to make sure that we really make use of all the stuff we dragged along. 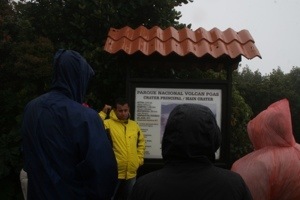 Day 3 began with a 7 AM bus departure for the Poas volcano, one of two active volcanoes we expect to visit on t his trip. The 90 minute bus ride brought us to the 8,000 foot elevation where the path to the main crater of the volcano could be viewed. Could be viewed, that is, if we weren’t standing in 55 degree temperatures in a driving rain, with enough fog surrounding us to remind one onlooker of standing in the inside of a full milk bottle. So we all huddled shivering and dripping around our guide who gamely tried to describe what we would be looking at if we could see anything, using the map at the scenic overlook. A very existential moment, to say the least. 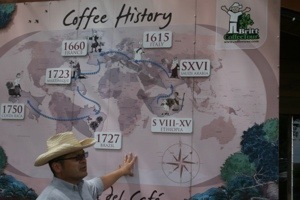 From there it was on to one of the largest coffee producers in Costa Rica (Britt Coffee) for a thoroughly entertaining and informative presentation on the planting, cultivating, harvesting, roasting, and brewing a superior coffee. I got to play the part of a “coffee cupper” in part of the show. I also got validation for all of the esoteric knowledge I have accumulated about coffee over the past 30 years or so. We ended the day checking into our “eco-lodge” in the middle of a rainforest close to the Caribbean Sea. Three sleeping buildings of eight to twelve rooms each, all built in a circular fashion with thatched roofs in the center and rooms around the edges of the circle. The main building, dining hall, bar, etc. are built in the same fashion, enormous thatched roofs with no outside walls, open to the elements. Tomorrow it is on to white water rafting (class 3 rapids), unless the river freezes over tonight. Costa Rica is always sunny and warm, right? Yeah, that’s what we thought, too.